SB boys celebrate back-to-back conference titles. 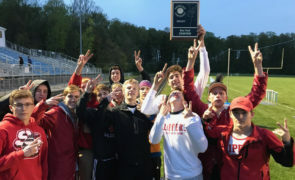 The Sturgeon Bay boys won the Packerland Conference track and field championship while the Kewaunee girls took top team honors at Southern Door on Monday. Sevastopol’s Olivia Wagner and Sturgeon Bay’s Connor Gajda won three individual events.